As the saying goes, a chain is as strong as its weakest link. This is the case for chains by themselves, but it also applies in general for all security systems which consist of several elements. The entire system is as strong as its weakest component. 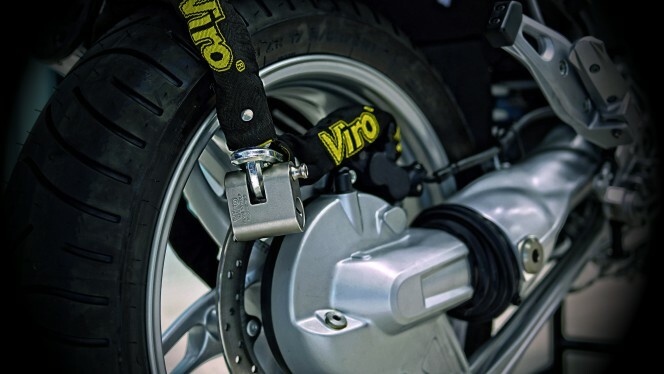 If you lock up your bicycle or motorbike with a system consisting of a lock and a chain, it is therefore important to evaluate not only the quality of the padlock but also that of the chain. If the chain is the weak point, any thief will attack this instead of padlock. Cross-section of the chain links. This is the most obvious factor. In fact, it is easy to understand that the larger the cross-section of the links, the stronger they will be. The most suitable cross-section for a chain used to protect a motorbike is about 13 mm, but 10 mm is still a good size. A chain with a cross-section of 7 mm may be considered to be suitable for bicycles. Profile of the cross-section of the links. This parameter can be easily assessed by eye, even though its importance is not as intuitive as its size. The point is that the shears normally available on the market are designed for cutting round cross-sections, such as those of steel bars, weldmesh and normal chains. For this reason, chains with half-square cross-sections, or better still hexagonal, are more difficult to attack. A Viro chain with half-square link cross-section. A Viro chain with hexagonal link cross-section. Materials used and heat treatment performed. These are decisive aspects since chains made of links with the same cross-section and profile but with different materials and heat treatments have decidedly different mechanical characteristics. Unfortunately, this parameter is not easy to assess by eye, so it necessary to rely on the guarantees offered by the seller and manufacturer. As often happens, the material from which the chain is made must be the result of a careful technical compromise. On the one hand, it must be hard enough to make it difficult to cut, but, on the other hand, it should not be so hard that it is brittle and breaks by cracking. To understand the difference between hardness and brittleness, one need only think of glass, which is harder and therefore more difficult to cut than wood, but is also more brittle and therefore easier to break. The links of a chain must of course be hard to resist cutting, but they must not be brittle. To open a link it must either be cut on 2 sides, in order split it into 2 parts, or cut only on one side and the gap created then widened, in order to remove the link from the next one. But if the material is too hard and brittle, cutting it from one side will break the other, thus halving the effort needed to open the chain. The most suitable materials are therefore manganese steel or nickel-chromium-molybdenum alloy steel, cemented, hardened and tempered. The manganese or the other additives are used to give the material greater hardness in order to better withstand cutting, as is the hardening process. Tempering is the process which reduces excessive hardness and prevents the metal from cracking easily. Cementing makes the surface more resistant to wear. 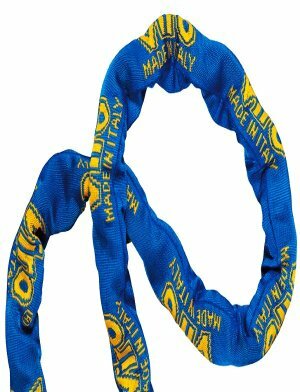 Chains with end loop. 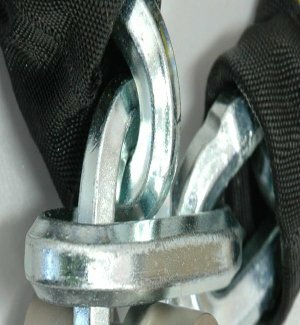 The best chains have one of the two end links longer, so that the other end can be passed inside it, and then closed in the padlock. This achieves 2 advantages. Firstly, no free spaces remain, in which levers can be inserted, between the bolt of the padlock and chain link. Also, the bolt of the padlock is effectively covered and protected by 2 links. 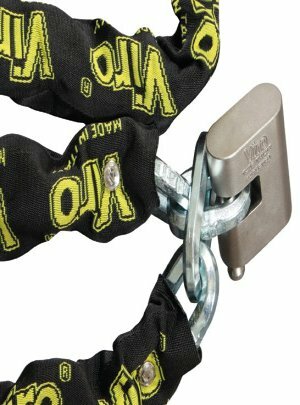 This increases the security at the fixing point of the chain to the padlock, which is one of the critical points. A Viro chain with end loop. Cover. The main purpose of the cover is to prevent the chain and the surfaces with which it come into contact from being damaged by rubbing or knocking against each other. But the covers do not merely have an aesthetic function. The synthetic fabric covers hamper the action of cutting shears and they must be cut before being able to directly attack the chain, thus slowing down potential thieves. This type of cover also makes the chain much more flexible compared with plastic covers, allowing them to be easily bent back on themselves and therefore stored more easily. A Viro chain protected by a nylon cover. Therefore, size certainly matters for chains, but other less obvious characteristics are also important. If you have found this information useful share it with your friends! 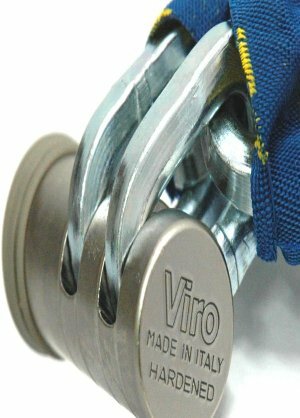 Look at the catalogue of Viro padlocks with chains, the Viro monoblock padlocks with chains and the Viro armoured padlocks with chains. This entry was posted in Motorbikes and Bicycles and tagged technology, tips on 28 September 2018 by Mara Rossi.